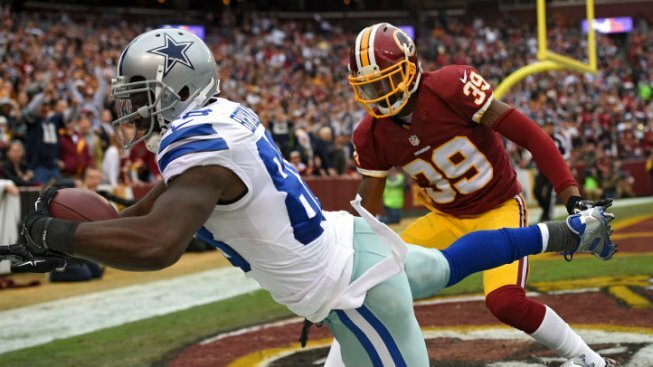 DeMarco Murray and Dez Bryant broke franchise records Sunday as the Dallas Cowboys prepped for the playoffs with a 44-17 win over the Washington Redskins. NBC 5's Pat Doney reported that the Cowboys will play the Detroit Lions on Sunday at 3:40 p.m. at AT&T Stadium in Arlington. If they win that game, they'll play the Green Bay Packers at Lambeau Field. Bryant caught scoring passes of 65 and 23 yards togive him 16 touchdown receptions on the season, breaking Terrell Owens' team record of 15 set in 2007.